British painter and printmaker of German birth. He was sent to England in 1939 and moved from school in Kent to London in 1947, where he began attending art classes at Hampstead Garden Suburb Institute and acting in fringe theatre. From 1947 to 1948 he studied at Borough Polytechnic under David Bomberg, whose teaching was especially valuable in its emphasis on risk and on seeking an organic, unified form. 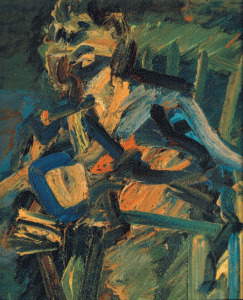 Auerbach continued in Bomberg’s evening life classes while at St Martin’s School of Art (1948–52). He considered his first original achievement to have been Summer Building Site (1952; Mrs P. Hill priv. col., see 1986 exh. cat., p. 8), of a scene at Earls Court; this was rather geometric and painted in formal, prismatic colour, but much of his early work was thickly and laboriously impastoed in earth colours, as in Head of E. O. W. (1955; U. Cincinnati, OH). He studied from 1952 to 1955 at the Royal College of Art and had his first exhibition at the Beaux Arts Gallery, London, in 1956.